This time of year always makes me think of my summers in Turkey. Oh, how I miss the busy streets of Istanbul, the late night dinners on my neighbor's balcony, and the fruit stands on the way home. It seems like every summer I know someone who gets to travel there (either from CBU or other connections) and I must confess that I am jealous. 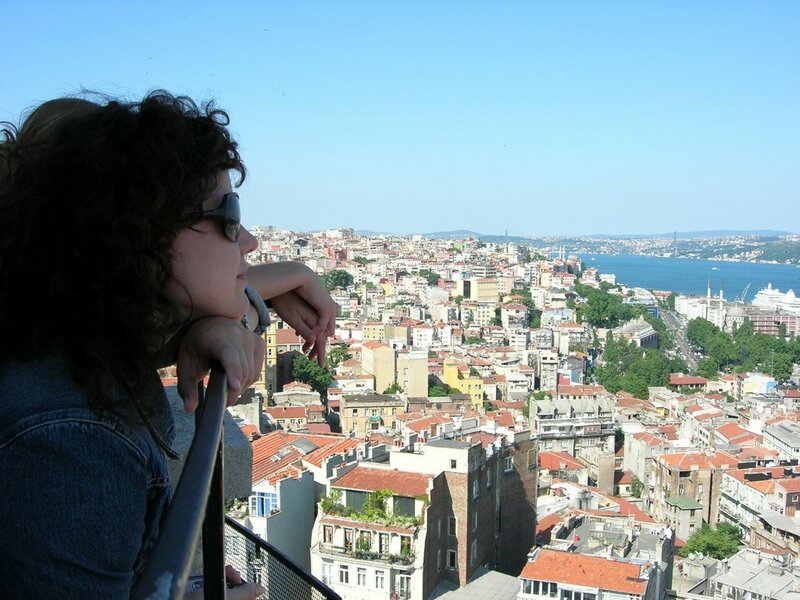 You simply must go to Galata and see this view for yourself. 360 degrees of pure Istanbul! Remember how fabulous this city and the people are? See what you are missing. Why have you not ventured into this historical Mediterranean heaven? where many men are Turkish and bald!! i know i know, i took the words right out of your head!! oh, how I love your poems, Kim! You should probably lay off the late night coffee, though, if it is making you think of the bald Turkish men. You gotta draw the line somewhere, you know? Love ya! This is MY favorite spot as well!! Great picture - i miss it too!!! I'm sure that your Mom and I are glad that you are NOT in Turkey since they had that TERRORIST attack today! Talked to your Mom the other day (called for a loan). She updated me on your upcoming opportunities- GOOD LUCK!